The flux capacitor for your voyage back in time! As old gaming veterans, we like nothing more than looking back at bygone times and complaining that everything was better back then. The prime example of this behaviour is the 1980s ... you know, when the first computers and consoles started taking over homes all over the world and we didn't need photorealistic graphics, just amazing gameplay. But oh boy, did those 8-bit processors deliver :). Nowadays, developers try to impress people with better graphics, cross-play features, in-app purchases and other more or less useful features. If you need a timeout from all that, the 8-bit Colouring Book will take you back to your childhood. Or your parents' childhood ;). Bring ghost hunters, tape decks and old gaming consoles back to life and plunge into an ocean of good memories. On 96 pages, you'll be able to restore amazing images pixel by pixel. So what are you waiting for? Grab your crayons and go to town! 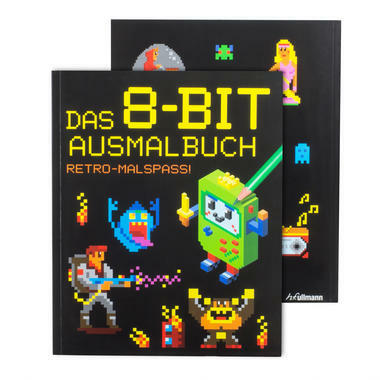 8,99 € lade... Colouring Book for Nerds Say goodbye to mandalas. 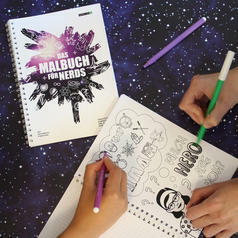 This time around, you can colour in nerdy images!